Because you can! In fact, you can do a lot of things with a beard: look a little younger, a little thinner, cover up some past, or just change your whole persona! Grow a thick, fantastic beard, and just watch how the heads turn. 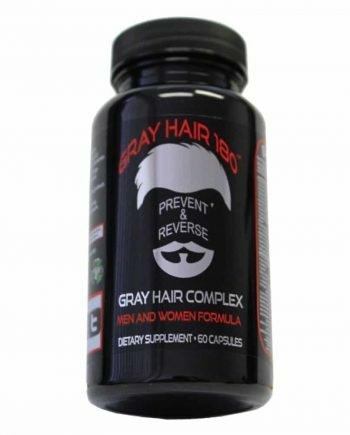 With an initial 10-day intensive program of 9 beard growth supplement capsules a day, followed by a regular care program of 3 capsules a day, you will see an amazing transformation in your beard thickness and texture. Sport a thick, awesome beard as early as 4 weeks into the program. And, RELAX, you’re using a 100% all-natural vitamin and botanical extract beard supplement to get there! Maybe it’s years of pent-up frustration of having to wear the same old penguin suit to work every day, or maybe it’s a search for our inner primal self, but whatever the reason, individuality has unmistakably come out lately with a vengeance. What better way to show that strong individualism than to sport a fashionable beard. So, are you thinking about growing one? A beard, that is! Was your last beard-growing experience a bad one: a scraggly patch of boar bristles, grown over a two-day camping trip? Our beard growth vitamins can help! You’ll be amazed at what you can do with Beardilizer beard vitamins! 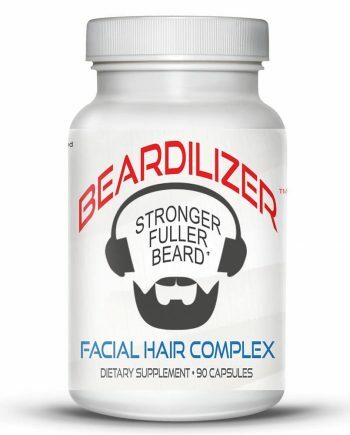 We offer a unique product called Beardilizer, which is essentially a multi-vitamin pill for the facial hair production system. Our 100% all-natural dietary beard supplement was specially formulated to stimulate and nourish facial hair growth. Most individuals will begin to notice a significant difference within the first 4 weeks of using the beard supplement capsules, and within 3 to 6 months, a substantially thicker and more lustrous beard is a given. So, go ahead and grow that beard that you’ve always wanted to. 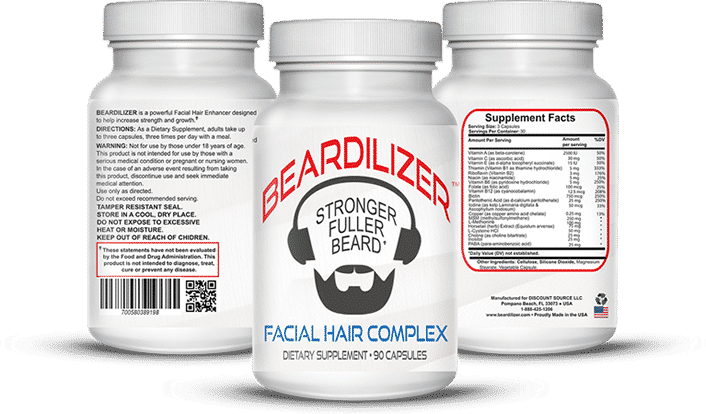 INDICATIONS: The Beardilizer beard growth supplement strengthens growth of facial hair (beard and mustache), and prevent dryness and itching of facial skin. Our beard growth vitamins now utilize a brand-new encapsulating technology, translating to completely odorless capsules with the same powerful formula and packaging. | DIRECTIONS: Adult intensive treatment: 9 capsules a day, for 10 days, as follows: 3 capsules in the morning, 3 capsules at noon, and 3 capsules at night; all must be taken with food. | Adult regular care treatment: 3 capsules a day, for as long as needed to achieve results desired: 1 capsule in the morning, 1 capsule at noon, and 1 capsule at night; all must be taken with food. METHYL SULFONYL METHANE (MSM): Helps to maintain a certain level of concentration of keratin in the skin, body hair, hair, and nails – Improving the appearance of facial hair and nails. L-METHIONINE: Amino acid providing essential elements in order to nourish the facial hair system in sulfur protein. BIOTIN: Helps to preserve the facial hair, skin, nails, and mucous membranes. EQUISETUM ARVENSE (HORSETAIL EXTRACT): Source of Silica strengthens the hair, bones, tendons, hair as well as nails. CHOLINE BITARTRATE: Strengthens the structural integrity of cell walls, the lipid metabolism as well as the production of amino acids and proteins. L-CYSTINE: Contains an amino sulfur and vitamin B6 which increases the production of facial hair and strengthens brittle nails. FUCUS: Rich in beard growth vitamins (B1, B2, B6, B12, C) and trace elements (copper, chromium, iron, iodine, manganese, selenium and zinc), strengthens the facial hair system, skin, hair, and nails. VITAMIN C: Helps the body to produce collagen, a protein essential for the formation of connective tissue of the skin, ligaments and bones. PANTOTHENIC ACID: Participates in the formation and regeneration of the skin and mucous membranes. INOSITOL / VITAMIN B12: Vitamin B complex that helps maintain healthy skin, hair, eyes, mouth and liver. PARA AMINOBENZOIC ACID (PABA) / FOLATE: Involved in the oxidation process leading to the production of melanin, the natural pigment of the skin and hair. BETA CAROTENE: Participates in bone growth and contributes to the health of the skin and mucous membranes. VITAMIN B1 / B2 VITAMIN / VITAMIN B6: Contributes to the health of facial hair system, bones, teeth, hair, nails and skin. NIACIN: Improves the growth of facial hair system, scalp, skin and nails. COPPER: Contributes to the pigmentation of the skin and body hair. I’ve always had a beard, and everyone gave me beard gifts for my birthday this year, and I actually got two bottles of this. I thought it was a joke, but my wife wanted me to start taking vitamins so I thought I would give them a shot. The bottle says to take 3 capsules a day with each meal. The capsules themselves aren’t very big and go down easy. There’s no taste, but when you open the bottle they smell really strong. Here’s the best part: It totally works. I can honestly say my beard has never grown so fast or been so thick and shiny. I just started my second bottle and I’m glad to see they are on Amazon with free shipping. If you have a beard, you’ve really got to try Beardilizer. I wasn’t sure what results to expect from taking beard vitamins, but after reading the positive reviews here I decided to give them a shot. After using them for about a month, my beard was noticeably softer and shinier. Now at four months I’m also seeing fewer stray hairs in the sink when I shampoo and comb my beard. My significant other has been complaining lately that my beard is too thick, so they definitely work! The directions on the bottle suggest taking up to three per day, though I usually just take one or two and that seems to do the trick. I’ll end the review with a small and happy side effect I’ve experienced from taking these. I’m not ashamed to admit on an amazon review that I’ve suffered from acne outbreaks on my chest and back since high school. 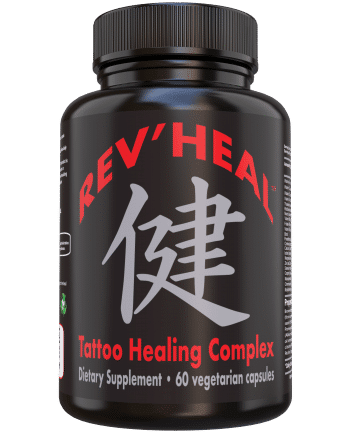 Since taking these supplements the acne has gradually cleared and is now just about gone – this after years of trying all sorts of topical ointments to no avail. I have no idea why these pills would have that effect, but I suppose a supplement that is meant to improve the health of your hair will also do the same for you skin. Needless to say, I’m very pleased to have tried Beardilizer and plan on using it for a long time to come! Been taking these beard vitamins for a few months and found they really do work, due to work conditions I only grow a beard on holidays but find the beard grows quicker and thicker than it did when I didn’t take the tablets. I used this to get over a growth plateau. Very please with the result.